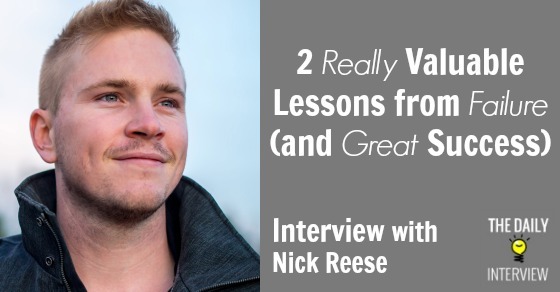 Today, we’re featuring serial entrepreneur Nick Reese. Nick has been through a lot in his entrepreneurial journey: From great success in e-commerce, to running an online business that helps people shop for broadband services, he’s had a lot of valuable experience. As Nick will point out in the interview, sometimes juggling too many businesses or projects can be stressful – and even catastrophic. 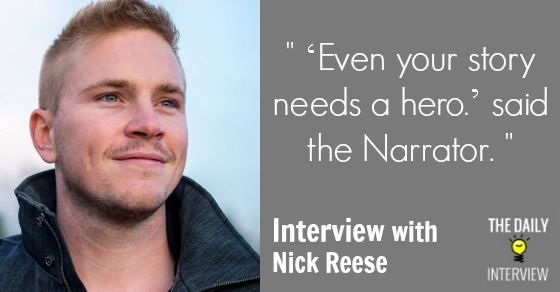 My biggest takeaway from this interview actually comes from two big lessons that Nick learned from a business where he saw his inventory basically vanish overnight. Keep reading, and find out what those lessons were. Nick, just looking through your site at NicholasReese.com, I don’t even know where to begin! (And I mean that in a good way.) It looks like you’ve been involved with several ventures yourself, and you’ve helped many other entrepreneurs with their businesses through some of the great content on your blog. Can you give us a brief overview of your background, and talk about what you’re working on today (in terms of whatever business(es) you’re most focused on)? Have you ever worked a “normal” job, or have you been an entrepreneur your entire adult life? Eric — Thanks for having me, love what you’re working on and stoked to share some insights with your audience. I’ve had 1 “normal job” but ultimately leveraged that into an opportunity to find a problem that I built my first successful business around. 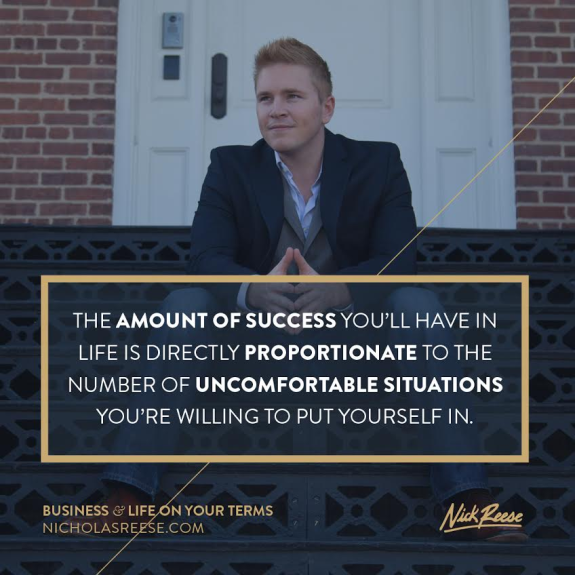 1 — NicholasReese.com, where I share actionable advice to help creative entrepreneurs grow their business quickly, without destroying their lives. 2 — Broadbandnow.com, where my business partner Duane and I are focused on simplifying the process of shopping for broadband and bringing awareness to the millions of under served households in the US. What has been your greatest success (or successes) so far throughout your various businesses? Greatest successes, well, it’s been a wild ride. Personally two of my proudest business moments were ringing the bell at the NASDAQ and speaking at the White House about what it takes to build a business in a tough economy. On the financial side I’ll just say we’ve done really well and I’ve got to have a lot of fun and travel the world while I was at it. Very cool. How did you get that opportunity to speak at the White House, and what was it like? I spoke at the White House with the YEC about young entrepreneurship and what it takes to build a business in a tough economy. It was a lot of fun, more hoopla than expected, but in the end it was an event to remember. The road to success is often filled with obstacles and failure, and entrepreneurs tend to take advantage of them to learn and grow. What has been your biggest failure to date in your business, and what have you learned from it? Hmm, biggest failure. Well there have been quite a few, but our most recent one was a silly one. My business partner and I built a small health supplement company (http://elitehealthblends.com), and after 5-6 months of sales, we shifted our team’s attention to another project and left it on the back-burner. As sales continued to roll in we thought everything was good. The the holidays rolled around and both of us were focusing on other things. Next thing we know, we login to our Amazon Seller’s Central account and our inventory is gone. … but since I buy so much via Amazon Prime, I filter all my Amazon emails into a separate folder and never saw the notice. More than 2,000 bottles of our supplement were destroyed and Amazon even charged us extra to do it. 1 — Businesses are built or destroyed by the details. I had my team prepare an expiration date document that set the date each bottle would expire. Even though the manufacturer said it would last 5 years, somehow I signed (and faxed) a document saying the product should expire just 11 months after bottling. After realizing this series of stupid mistakes, it was time to decide what to focus on and what to cut. The result was shutting down multiple small income streams that required attention, selling my equity in multiple side projects, and really narrowing my focus down to just 2 things maximum. So far, it’s made a world of difference. What’s your general strategy for staying organized and keeping productivity up without burning yourself out? To be honest, I was involved in too much. It’s obvious by the silly mistake that shut down our supplement company. I wouldn’t recommend anyone try to manage as much as I was. Today I wouldn’t recommend anyone try to juggle more than 2 businesses without an outstanding team and a “CEO” or point person for each. I understand you’ve helped people make the transition from “9 to 5” job to full-blown entrepreneur and business owner. For someone who currently works a “9 to 5” job that they’re dying to break free from, but don’t know where to begin, what would you recommend (in general)? What’s are the most common struggles for someone in this situation, and how have you helped people overcome them? Transitioning from a 9-5 job isn’t as hard as it sounds, it just requires belief that you can do it and a serious commitment to make it happen. While the results won’t be instant, typically I’ve found that by following a few specific techniques, most people can replace their full time income within 6 months to a year. That said, it does require hustle and the willingness to figure things out as you go. There is no clear cut plan. What I typically suggest is that people focus on taking the current skills they have and begin freelancing with them. No personal website required, just hop on your favorite freelancing site and start responding to ads. Once they’ve been doing it for a month or two and have learned the ropes, their best bet is to learn to position themselves to charge higher prices, use a referral system that actually works, and then work on mastering their marketing. The problem most people have is they doubt their business idea before they even get started. Problem Awareness: How to find a good problem to solve. If you had to take your best advice or inspirational thought and put it into one sentence or phrase, what would that be? For me, this is a daily reminder that I am the narrator of my life and that how I act today will determine if I’m the hero (or some other role) in my story. Gingkoapp.com — Multi-column writing tool. It’s the best creative writing tool I’ve ever discovered. Thanks for sharing your story with us, Nick! What did you think about this interview? Leave a comment below! Wow – very interesting story and a lot to learn from. Managing information overload whilst trying to validate ideas and build businesses is a big problem. Thanks for sharing these. I wish more people would do these sort of text interviews rather than podcasts. The editing makes ask all the difference. Keep up the good work.